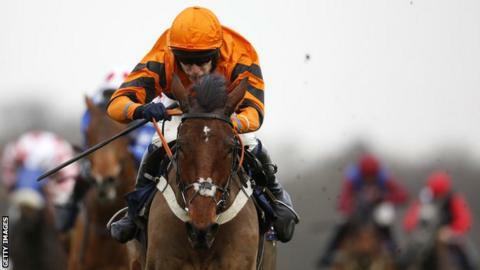 Thistlecrack ended the three-year reign of Reve De Sivola to cruise to an impressive victory in the Grade One Long Walk Hurdle at Ascot. Trained by Colin Tizzard, the 2-1 favourite took control at the penultimate hurdle and pulled away to win by eight lengths. Jockey Tom Scuadmore said: "He gave me a lot of pleasure. It's a special day." Reve De Sivola held on for second and Deputy Dan trailed in third, another 12 lengths further back.